This exhibition presents outdoor images of basketball courts and hoops—public and private—that have captured the attention of photographer Bill Bamberger. Collectively, they celebrate the sport and reveal both its global importance and enduring appeal. Hauntingly devoid of people, the images are nonetheless remarkable neighborhood and community portraits. HOOPS will present a selection of large-format photographs taken across the country and in more than half-a-dozen countries, from the deserts of Arizona and Mexico to the hills of Appalachia, and from the streets of the Northeast to the playgrounds of South Africa. Whether tacked to the side of barn, subject to salt-water breezes, or surrounded by brick and chained links, the hoops and courts presented in the exhibition are sure to resonate and captivate the imagination. HOOPS opens just in time for “March Madness” and the NCAA Division I Men’s Basketball East Regional games that will take place at nearby Capital One Arena. 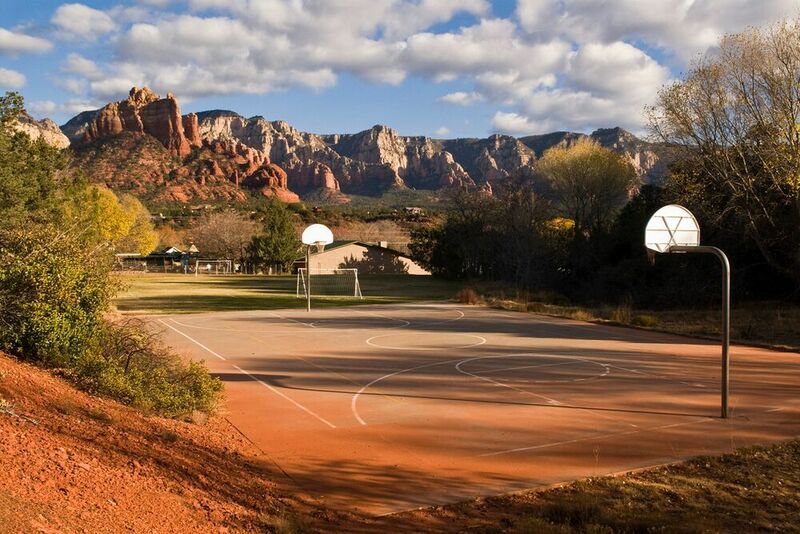 Public school playground, Sedona, Arizona. 2009. Photography by Bill Bamberger. Alex Harris and Christopher Sims are both showcased in the Halsey Institute of Contemporary Art exhibition Southbound: Photographs of and about the New South, which is on view through March 2, 2019. Recognizing the complexity of understanding any place, let alone one as charged as the American South, the curators’ approach is transdisciplinary. The photographs are complemented by a commissioned video, an interactive digital mapping environment, an extensive stand-alone website, and a comprehensive exhibition catalogue. Southbound will travel to venues in North Carolina, Tennessee, Mississippi, and Louisiana through 2021. Installation view of Southbound shows Christopher Sims’s work on left from Theater of War: The Pretend Villages of Iraq and Afghanistan. Installation photograph by Rick Rhodes Photography. Alex Harris’s and Margaret Sartor’s newest publication, Where We Find Ourselves: The Photographs of Hugh Mangum, 1897–1922, forms the basis of an exhibition at the Nasher Museum of Art at Duke University. Self-taught photographer Hugh Mangum was born in 1877 in the newly incorporated, tobacco- fueled boomtown of Durham, NC. As an itinerant portraitist working primarily in North Carolina and Virginia in the shadow of the segregationist laws of the Jim Crow era, Mangum welcomed into his temporary studios a clientele that was both racially and economically diverse. After his death in 1922, his glass plate negatives remained stored, out of sight, in a tobacco barn on his family farm for 50 years. Slated for demolition in the 1970s, the barn was saved at the last moment, and with it, this surprising and unparalleled document of life at the turn of the 20th century, a turbulent time in the history of the American South. The exhibition was organized in conjunction with the publication of the book Where We Find Ourselves: The Photographs of Hugh Mangum, 1897–1922, from the University of North Carolina Press in association with the Center for Documentary Studies at Duke University in the series Documentary Arts and Culture. Informal Gallery Talk at the Nasher Museum of Art: January 18, 2019, from 5:00 to 7:30 pm. Bill Ferris won two Grammy awards February 10th in Los Angeles. Ferris’ box set “Voices of Mississippi” won best historical album and best album notes. The four-disc set features dozens of Ferris’ audio recordings of blues and gospel musicians, storytellers and documentary films. This spring, our Art @ the Center exhibit features photographs taken during the Civil Rights Movement between 1960 and 1970. The images in this collection offer a glimpse into the courage and brutality of the 1960s, a decade that unleashed hope for the future as well as profound and tumultuous changes. Viewers will recognize photographs of protesters carrying signs with messages such as “I AM A MAN” or sitting at segregated lunch counters as iconic, familiar images associated with the Civil Rights Movement. Our exhibit is proud to emphasize the role of student activism in the Civil Rights Movement while also featuring organizers, journalists, and ordinary citizens who risked their lives to end Jim Crow segregation within the American South. Collected by an inter-institutional team of researchers led by Professor Emeritus and former Senior Associate Director of CSAS, Bill Ferris, these images were recently hosted at the Pavillon Populaire in Montpellier, France. Photographs will remain on display through May 2019. 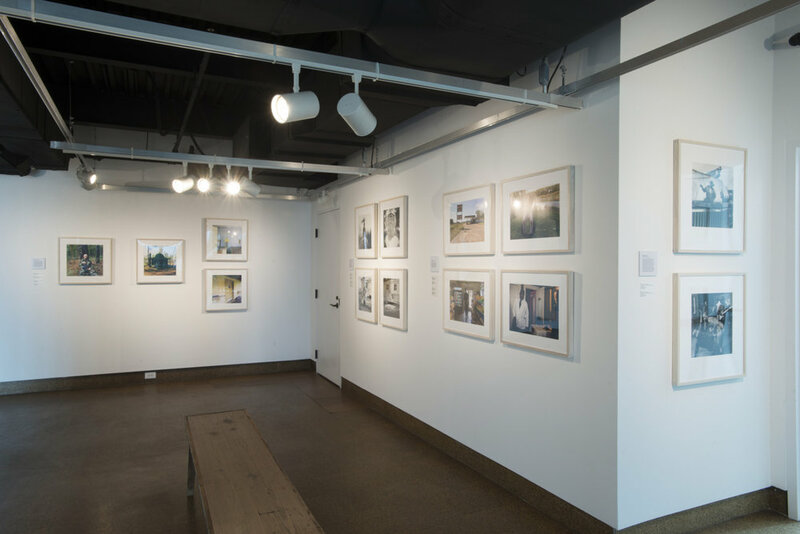 Bill Bamberger, Alex Harris, Margaret Sartor, and Christopher Sims were featured in the Nasher Museum of Art exhibition Across County Lines: Contemporary Photography from the Piedmont, which was on view through February 10, 2019. Bill Bamberger, T. Cash and Betty, Downtown Durham from the series Durham County, 1982. 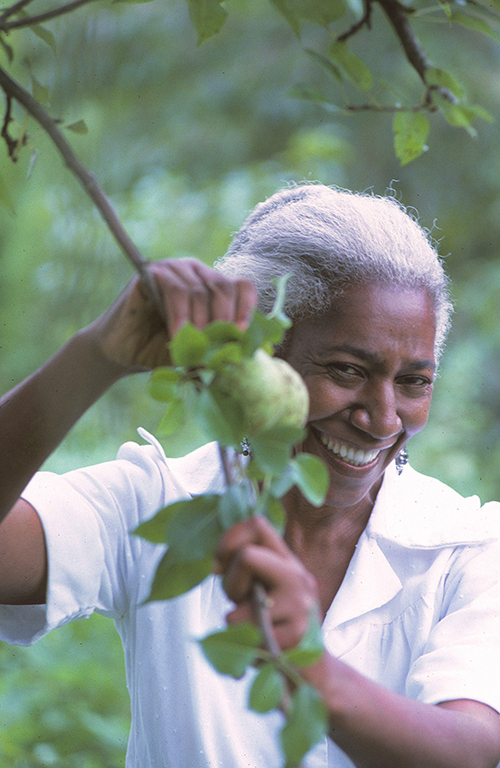 From October 27 until December 9, 2018, Haverford College celebrated Lewis’ legacy with Edna Lewis: Chef and Humanitarian, an exhibit of 40 black-and-white and color photos of Lewis by John T. Hill, a close friend and photographer who made the portrait that adorns her first cookbook, alongside Lewis’ own family photographs, articles on southern cooking, and her books. All of the visual material is accompanied by wall texts to complement the photographs, Lewis’s life, and her rural African and American roots—the effect of which is to show how her environment influenced her approaches to cooking and living. The exhibition was on display at Haverford College’s Atrium Gallery in the Marshall Fine Arts Center. Edna Icing Cake for House and Garden Essay, 1973. Photograph by John T. Hill. Larry Schwarm has recently been featured in exhibitions at the Spencer Museum of Art at the University of Kansas, the Wichita Art Museum, and the Annenberg Space for Photography. His photograph, Fire and moon along Bloody Creek Road, Chase County, Kansas, 2005, was published in a full-page spread in The New Yorker to accompany an article by Ian Frazier. Please note: An excellent new book on Edna Lewis has just been released by UNC Press: Edna Lewis: At the Table with an American Original, edited by Sara B. Franklin. The book includes a photographic essay by John T. Hill, as well as the photograph on the jacket cover. Edna Lewis went from a rural crossroads community called Freetown, Virginia—founded by previously enslaved people, including her grandfather—through Washington, D.C. to New York, and eventually returning to the South. In New York, in 1949, she became a partner and chef at Café Nicholson. There, prominent figures like Eleanor Roosevelt, Jackie Robinson, Paul Robeson, William Faulkner, Truman Capote, and Tennessee Williams came to enjoy Southern hospitality and meals with a French influence. The Taste of Country Cooking, by Edna Lewis, with help and encouragement from famed editor Judith Jones, was published in 1976. It has been adopted and absorbed by a host of America’s most influential chefs and food writers. No one taught me to cook. I just saw it—at Aunt Jenny’s up the path, and in my mother’s kitchen. Mama Daisy, I called her. In summer she made perfect sweet potato pies in an old wood stove in our outdoor kitchen. In winter she made ash cakes—fresh ground cornmeal baked in the ashes—on an open hearth. Cooking was simply a part of my life. Spring breakfasts when the shad were running. Emancipation Day dinners in the fall. The chicken-and-dumpling stews after ice cutting in January. Clementine Paddleford: in her review of Café Nicholson and Edna Lewis’s desserts. This exhibition will include photographs of Edna Lewis that have never been published or publicly exhibited. A select number of images from the show will be available for purchase through Ann Stewart Fine Art. Charter school playground, Harlem, New York, 2007. From Maine to Florida, Rwanda to Mexico, a basketball hoop indicates a place where the sport is played and where communities and relationships are built. As a vital element within a community, the hoop becomes an integral part of each location’s unique narrative. In these highlights from his Hoop series, photographer Bill Bamberger places the viewer courtside to a variety of cultures and landscapes. Bill Bamberger, a Durham resident and instructor at Duke University’s Center for Documentary Studies and the University of North Carolina at Chapel Hill, began photographing basketball hoops in 2004. The first photograph in his Hoop series, Rental House, Nags Head, North Carolina, is on display in this gallery. The entire series spans thirteen years (2004 – 2017) and includes thousands of photographs from thirty-eight states across the U.S. and nine countries worldwide. With images of urban and rural, active and abandoned sites in the U.S. and around the world, Courtside presents seemingly disparate places side by side. Each made in a different geographic location, the selected photographs demonstrate the ability of a hoop and court to reflect and reveal the people who use and create them. In this series, Bamberger gives viewers a front row seat, a perspective that is at once familiar and fresh, from which to see and recognize our common world. This exhibition is organized by students in the Nasher’s first Curatorial Practicum class as part of Duke’s Undergraduate Concentration in Museum Theory & Practice: Janie Booth, Savannah Chauvet, Jessica Chen, and Brittany Halberstadt. All photographs are courtesy of Bill Bamberger. Church Playground, Kinihira, Rwanda, 2013. City park, Portland, Maine, 2006. Saturday, September 30, 5:00–7:00 p.m.
By the time I arrived in Cuba, I was no longer the same person who looked through the lens of my camera in search of family and community. I had my own family. And I was finally interested in photography itself, in what my pictures could tell me that I wasn’t already searching for or didn’t already know. I was also aware one crucial thing from my earlier work as a photographer that served me well in Cuba and guides me in my work today: how to immerse myself in a world and at the same time observe it, how to step back from the moment I am experiencing and take a picture—how to be at once near and far. For over forty years, Alex Harris has photographed across the American South, and in locations as disparate as the Inuit villages of Alaska, the streets of Havana, the fish markets of Mumbai, and the Hispanic settlements of northern New Mexico. Now Harris has selected photographs— some well-known and others that haven’t been widely seen—that are especially meaningful to him from across his body of work. In this exhibit, Harris also explores the various ways he’s approached and thought about the idea of distance as a photographer. Alex Harris is a founder of the Center for Documentary Studies and of DoubleTake Magazine. His awards include a Guggenheim Fellowship in Photography, a Rockefeller Foundation Humanities Fellowship, and a Lyndhurst Prize. Harris’ work is represented in major photographic collections, including The Museum of Modern Art in New York, The San Francisco Museum of Modern Art, and the North Carolina Museum of Art. His photographs have been exhibited widely, including exhibitions at the International Center of Photography in New York and the J. Paul Getty Museum in Los Angeles. On commission from the High Museum in Atlanta, Harris is currently photographing on independent movie sets across the South. Wednesday, October 25, 5:30–7:00 p.m. 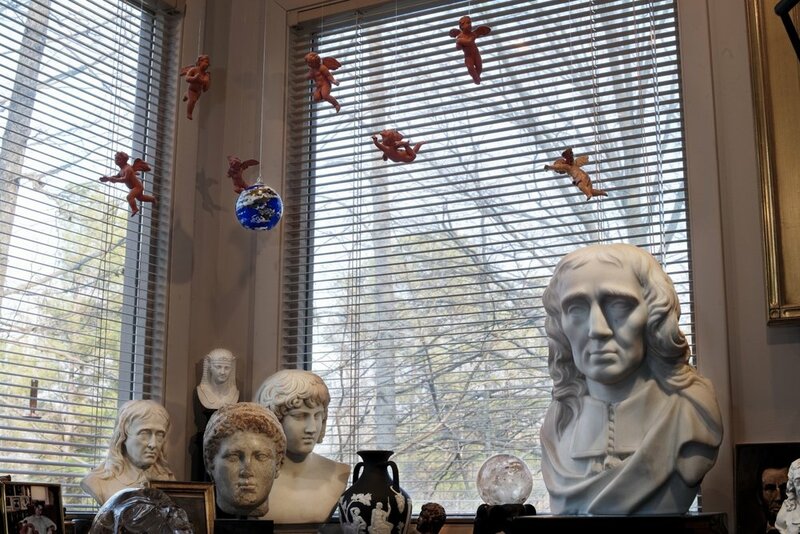 Along with a gallery talk for the exhibition Near and Far, Alex Harris and Margaret Sartor will be signing copies of Dream of a House: The Passions and Preoccupations of Reynolds Price. Talk begins at 6:30. Friday, August 18, 5:00 to 7:00 p.m.
Bill Ferris, who is the Joel R. Williamson Eminent Professor of History at the University of North Carolina at Chapel Hill and a former chairman of the National Endowment for the Humanities, will be on hand tonight at the opening for his exhibition, The South in Color, at Fischer Galleries in Jackson, Mississippi. Lemuria Books will have available copies of The South In Color (published by the University of North Carolina Press) for purchase. The artist will be present to sign books and talk about his work. William Ferris was born and raised on his family's farm in Vicksburg, Mississippi. Since the moment William Ferris's parents gave their twelve-year-old son a Kodak Brownie Hawkeye camera for Christmas in 1954, Ferris passionately began to photograph his world. He has never stopped. The sixties and seventies were a particularly significant period for Ferris as he became a pathbreaking documentarian of the American South. This beautiful, provocative collection of Ferris's photographs of the South, taken during this formative period, capture the power of his color photography. Color film, as Ferris points out in the book's introduction, was not commonly used by documentarians during the latter half of the twentieth century, but Ferris found color to work in significant ways in the photographic journals he created of his world in all its permutations and surprises. Two exhibitions of photographs by award-winning photographer Christopher Sims will be on view in the Davis Library gallery at UNC–Chapel Hill through Fall 2016. On September 30, 2015, Sims delivered an artist lecture about the photographs, making use of the immersive Liquid Galaxy Google Earth display in the Research Hub of Davis Library. The free public talk was followed by a reception and exhibition viewing. “[Guantánamo Bay] holds a certain meaning to us,” Sims told NPR in 2012, “but we don’t really know what the place looks like.” In the end, it took Sims more than two years of writing letters and submitting applications before he was allowed to visit the site and take photographs of environments and objects, but not of people. Sims is the Undergraduate Education Director at the Center for Documentary Studies at Duke University. He received the Baum Award for An Emerging American Photographer in 2010; was named one of the “new Superstars of Southern Art” by the Oxford American magazine in 2012; and is a 2015 recipient of the Arte Laguna Prize, one of Italy’s most prestigious photography awards. He is available to visit with classes about his photography projects based at Guantánamo Bay. Sims is represented by Ann Stewart Fine Art, which organized the exhibitions in the Davis Library gallery. Author Robert Forbes (also Vice President of Forbes magazine and President of ForbesLife magazine) has written a series of poetry books for children. The books are fabulously illustrated by British artist and master illustrator, Ronald Searle, famous for his book series about St. Trinian's School and for work appearing in the New Yorker, Le Monde and other publications. Forbes's recent book, Beastly Feasts! A Mischievous Menagerie in Rhyme (Overlook Juvenile, 2007) is the source for a current exhibition at Wilson Library at UNC in Chapel Hill. The poems and 38 original Searle drawings from the book are on display. The exhibit has been extended until October 31 and is highly recommended. During a recent visit to North Carolina, Forbes gave a reading at the North Carolina Museum of Art and read to hundreds of children in local elementray schools. He also spoke at the Ackland Museum in connection with it's current show, Carolina Collects. Forbes, a photography collector, has artworks included in the Ackland exhibition.